The City Soul Choir is a secular Vancouver community choir led by music director Brian Tate. The idea to launch the choir was officially hatched by Brian and his wife, Patricia, and a group of friends in January 2010. One month later, the choir had 120 auditioned singers. The City Soul Choir is renowned for its joyful, energetic performances. It draws from the soulful songs of many traditions - R&B, spirituals, gospel, pop, world, folk, and more - music that uplifts, inspires, and transforms. The choir produces several concerts per year, and also sings at community outreach events. See upcoming concert information on the home page. Brian received his Bachelor of Music degree from the University of British Columbia, and went on to further music studies in London, England, and Toronto. His love for music of many kinds has led to a diverse career that includes orchestral and choral conducting and performing, musical theatre, and composing music for film, television, stage, and the concert hall. Brian has twice received Vancouver's Jessie Richardson Award for original theatre music, and his choral music is performed worldwide. As a vocalist, Brian performs with a jazz quartet (BTQ), and with Dawn Pemberton and Karla Mundy in the vocal a cappella trio, TriVo. Brian is known for his lively choir workshops, precise conducting skills and ability to bring out the best in choirs, and for his exhilarating and inspiring choral compositions and arrangements. He is on the faculty of Studio 58, Langara College's professional theatre school. Brian is also a learning leader for the Next Institute, where he uses music, theatre, and cartooning as tools for organizational training. 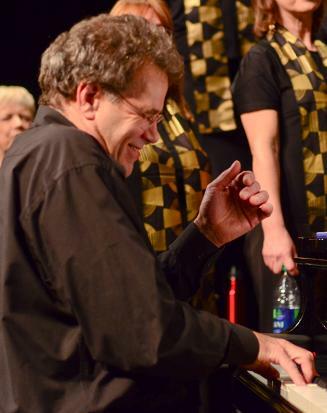 Michael Creber, one of Vancouver's top pianists and an all-around great guy, is the choir's resident accompanist. 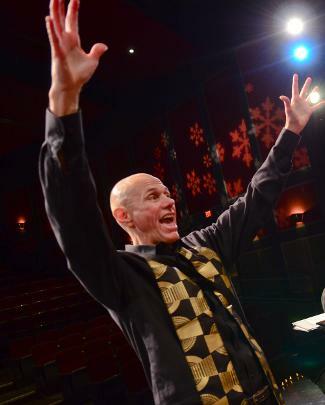 In January of 2019, Michael is in the position of assistant conductor, and piano duties are filled by either Tom Arntzen or Bill Sample. Having experienced Brian Tate's musical leadership and musicianship on a number of occasions, I can testify that he brings exceptional energy and passion to the task. Brian doesn't just provide musical leadership. He becomes the music, embodying the message of peace, justice, and love in a way that is positively contagious. This is a man of deep integrity, whose music is driven by a deep purpose of personal and social transformation.